Back in my last year of high school, I had one of those long-gone archetypal English teachers—Miss Margaret Casey, a stout rosy-cheeked New England spinster in a flowered dress with her gray hair up in a bun and glasses dangling on a chain around her neck. She had a piping voice. On Mondays two things would happen. She would assign that week’s essay, due Friday. And she would return the previous week’s essays, which were retrievable at the end of class from a wooden out-basket in the back of the room. So, duly summoned, I poked my head into her empty classroom each Tuesday morning. For most of the hour before the school day started, we sat catty-corner at her desk while she sternly pressed me over what I could possibly have intended to say in this essay of mine, and then walked me though the Flanders field that was my prose—one paragraph, one sentence, one dangling participle or misplaced comma at a time. “Would T.S. Eliot have written this line?” Miss Casey would ask. What reply was possible? She had made us read “The Hollow Men” in class, aloud, as a chorus. Other than something about stuffed men, leaning together, headpiece filled with straw, I had no idea what T.S. Eliot would or would not have written. But what I did know, by the time our year was done, was that I’d better care about what I wrote or not write it. 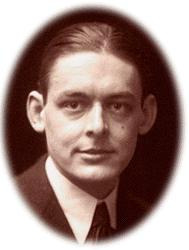 I knew as well that to please Miss Casey, I’d be willing to try awfully hard to write, if not quite like Mr. Eliot, then at least like a more diligent and self-respecting version of myself. High literary standards can be simultaneously inspiring and intimidating, and there’s an argument to be made that by dragging in T.S. Eliot you can scare the bejeezus out of a new writer and leave him so concerned with being perfect that he might just give up. On the other hand, I remember that Miss Casey liked my last essay. And I remember that feeling, which I am still chasing. The family photo of Miss Casey, dressed in pearls for her portrait, ran with her obituary in the Washington Post. It’s an amazing read. This is wonderful. You guys are going to make Joe Holley a star. Wow… You were very lucky to have such a teacher.